Hello, everyone. This is Dr. Reed Storme again. I asked if I could blog here this month because I have some pet health matters I wanted to bring up. In case you don't remember me, I'm a veterinarian at the Knobcone Heights Veterinary Clinic, where Carrie Kennersly, previously a full-time veterinary technician here, now works part time. I really admire Carrie--and think a lot of her. She has essentially two, or maybe three, careers now, since she also owns two bake shops here in town, Icing on the Cake, where she sells baked goods for people, and Barkery and Biscuits next door, where she sells dog treats made from recipes she mostly developed while at our clinic. She's concerned about pet health, too, and of course that's another thing I like about her. Mostly this month I just wanted to remind readers that it's August. Yes, this year seems to be going fast. But please remember that August is summer. It's hot. Pets can be hurt or even killed if you leave them in your car while you go shop or otherwise leave them there. Of course I encourage you to visit Carrie's bakeries, but bring your pets inside the Barkery if you happen to go there. Otherwise, they could be the ones who bake, inside your car. I've seen people leave their pets in cars with the engines running so the air conditioning works. That's less dangerous, but even so I'd suggest not doing that, either. What if the air turns off? What if someone uses the opportunity to steal your car--and, therefore, your pet? Okay, enough of that. You get it. And I think Carrie is going to appreciate this post. I hope so. In case you can't tell, I really care for her. I worry about her, too--and not because I leave her shut in hot cars. These days she seems to be solving a lot of murders, so she sometimes puts herself in danger. As you might know, her latest adventure was memorialized in TO CATCH A TREAT, and she got involved there because her brother Neal's new girlfriend Janelle Blaystone was a murder suspect. Carrie tells me that she appreciates my concern--and that she appreciates me--but she'll do what she needs to do to help people as well as pets. I get it. And I hope she and I continue to see one another, and that she stays safe. And remember: no pets locked in hot cars! 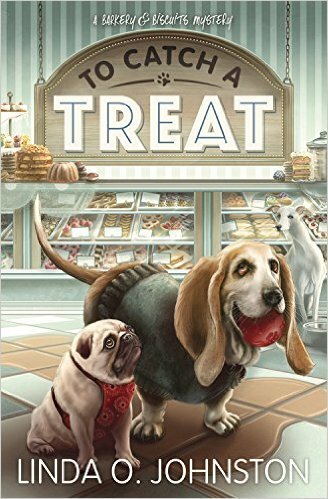 TO CATCH A TREAT, the second Barkery & Biscuits Mystery by Linda O. Johnston, was a May 2016 release from Midnight Ink. I love pet themed mysteries and wish we had a pet bakery where I live. Kudos to your reminders about safety for our pets and not to leave them in hot cars. I wish more stores had an open policy about pets. They are family. Pets are definitely family, Dianne. Thanks for your kudos! I hate seeing pets locked in cars and have sometimes brought in a shopping center's security folks to find the owners. --Linda this time, not Reed! Great reminder for pet owners. Enjoy your books.